The organization also expressed its enormous concern for repression carried out by the illegitimate regime of Nicolás Maduro and demands the full restitution of the constitutional order. The SI said that the only way to move forward in that country is with the urgent holding of new elections, according to the document approved at the end of a two-day meeting in Santo Domingo. These elections must be monitored by a new, fully independent and impartial electoral authority and must take place with the participation of those previously qualified and be accompanied by the release of political prisoners, the resolution added. Guaidó, President of the Parliament, was inaugurated as interim President of Venezuela last January 23 based on country’s Constitution, since the Parliament and dozens of countries do not recognize the second term of Nicolás Maduro's administration (2019-2025). Tags: Juan Guaido, left wing, Leopoldo López, Nicolas Maduro, protests, Socialist, Socialist International, Venezuela, Venezuela crisis, Venezuelan National Assembly, voluntad popular. Hezbollah also may not have anything to do something but I heard that they [perhaps, backed by Russia] are clandestinely in Venezuela, already. The specialists from Israel - 130 soldiers [Mossad?] - are officially in Brazil under the cover-story [?] of search-and-rescue & recovering the dead from the Brumadinho Accident [?]. 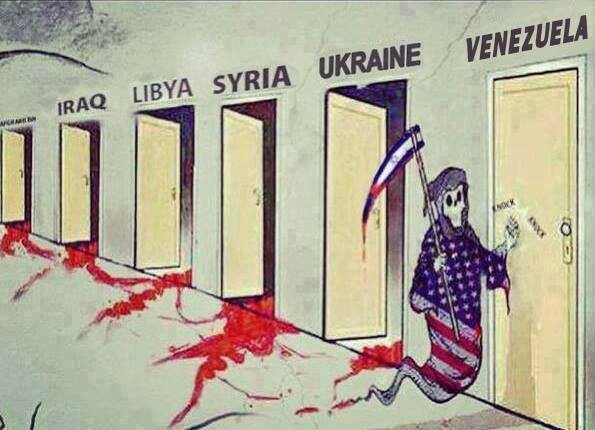 It ought to be a Russian Death coming out of the Ukraine door. And the Israel flag is just conspiracy theory, Israel might possibly influence US policy on Syria but they have nothing to do with Venezuela.